Everyone should learn how to code. That is what we are hearing from the tech industryopens a new window, celebritiesopens a new window, President Obamaopens a new window, Mark Zuckerbergopens a new window, Sheryl Sandbergopens a new window, and yes, even Ashton Kutcheropens a new window. Code.org, a non-profit launched in 2013 and dedicated to expanding access to computer science (especially for women and minorities) believes this so much that they launched Hour of Code, an initiative to get everyone to try coding for just one hour. Whether or not you believe the hype, learning how to create and design with any coding language can be a fun, rewarding experience. Writing code exercises the parts of your mind that control logic and problem solving. And once you know some code, you can teach others, which strengthens your teaching skills! There are many ways to get your feet wet and as luck would have it, most of them are pretty fun to try out. At ELPL when we teach any beginning coding workshop we start with Scratchopens a new window, an amazing online coding experience designed by the brilliant minds at MIT's Lifelong Kindergarten Group at the MIT Media Labopens a new window. Scatch is free to everyone and works right in a web browser. There is no need to download any additional software. Scratch also uses interlocking colored "blocks" to build code, instead of typing out commands. This not only helps to reinforce the ideas of process, order and logic, but it also allows very young children who aren't comfortable with a keyboard to get in on the fun. With Scratch, coders can create animations, games, and musical creations. The Scratch contains everything you need to get started and become proficient with Scratch, but we've also acquired some great books for the library's collection that showcase many neat Scratch projects. 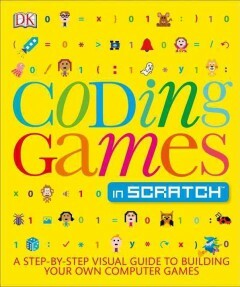 My favorite, and the favorite of kids in the library's coding workshops, is Coding Games in Scratchopens a new window by Jon Woodcock. We have printopens a new window and eBookopens a new window copies and soon, we'll have additional copies at the ELPL 2.0 Maker Studio for anyone who wants to drop by and try out Scratch on one of the Maker Studio computers.